Milestone's muddiest bike racer returns in the second outing for the Monster Energy Supercross series. Once again players don the helmet of one of the sport's elite athletes to get wild and dirty with some offroad racing. 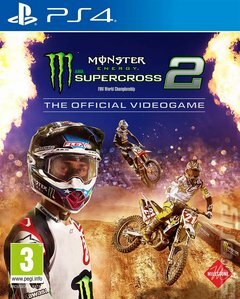 Monster Energy Supercross 2 includes upwards of 80 official racers from the 2018 season including the likes of reigning 450SX Class champion Jason Anderson and Marvin Musquin, as well as the first ever videogames appearance for Eli Tomac. This time out Milestone has placed a lot more emphasis on the career mode, and on what happens off the track in particular. Alongside gnarly, muddy racing you'll also get into the grist of fan meets, media days and more. Another new addition this time out is 'flow aid'. Similar to the braking line in a game like Forza, it sees an overlay appear on the screen that will help you take the best path around the course and perfect the timing of your jumps. You can certainly get round the course without it, but if you're new to the game or want to perfect a course it will be a big help. The track editor makes a return to extend the life of the game beyond the out-of-the-box offering. It's been tweaked and built upon since last year to make developing your own courses a little easier, and you can share your creations online. You can change your in-game appearance to your heart's content, too, with more than 3,000 customisable items and over 300 different mechanical parts for your bike.